Image caption A final vote on a state takeover plan of the city is expected next week. The US city of Harrisburg - capital of the state of Pennsylvania - has filed for bankruptcy, a move quickly opposed by the city's mayor. 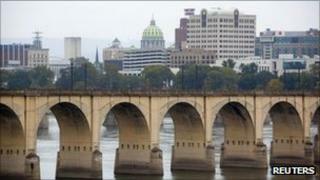 Harrisburg faces debts of $300m (£190m) and has struggled to pay for services. The move comes as the state legislature considers a takeover of the city and the implementation of a "rescue plan". Last year, municipal bond analysts expected many bankruptcies from cities under debt pressure, but few localities have actually taken the step. The city council voted 4-3 on Wednesday to file for bankruptcy under a rarely used code for towns and cities. Filing for bankruptcy is opposed by the city's mayor, Linda Thompson, who challenged the legality of the vote in a news conference on Wednesday. According to Ms Thompson, city law requires the mayor and the city solicitor to sign off all hiring of outside lawyers, as well as have the city solicitor approve all ordinances and resolutions considered by the council. Neither was done in this case, she said. "They have been dishonest with the entire community for months," the mayor said about the council. "I am ashamed of the behaviour." Debt woes have plagued the city of 50,000 since 2010, when an incinerator project funded by municipal bonds failed to raise expected cash. Although city services should continue, the vote has caused confusion about how bills will be paid. "We're getting calls from vendors, wondering if they are going to get paid," said Brenda Alton, the director of city's department of parks. Pennsylvania Governor Tom Corbett told the Associated Press news agency the city should agree to a rescue plan under the state's program for distressed cities. Pennsylvania's state House of Representatives has already passed a bill that calls for a forced implementation of the plan. The state Senate will vote on the bill next week. Such a plan would include renegotiating the city's labour deals, cutting jobs and putting its most valuable assets up for sale or lease, correspondents say. That would include the incinerator, as well as parking garages. But the city council says that plan would benefit creditors at the expense of the city. "I think [bankruptcy] is the only real option that we had," said City Controller Dan Miller. "They wanted to sell all of our assets and make Harrisburg destitute for decades to come," he said. Mark Schwartz, a lawyer for the city council, said declaring bankruptcy would give the city "bargaining power" with its creditors and with the state. Cities and towns rarely file for bankruptcy, but it is not without precedent. The largest Chapter 9 bankruptcy occurred in 1994, after Orange County, California, suffered more than $1bn in investment losses. In 2008 the city of Vallejo, California, home to 120,000 people and the small city of Central Falls, Rhode Island also filed for Chapter 9. While a number of bankruptcies were expected during 2010, with the recession increasing demand for services as revenues were cut, they did not materialise. Not all states allow local governments to file for bankruptcy, and unlike companies, governments have the ability to tax. It is also an expensive process and does not necessarily mean municipalities will come out of the process with a vastly improved financial situation, correspondents say. "Bankruptcy proved to be a bad deal for Vallejo," said Richard Ciccarone, a municipal bond specialist. The city has had to make major cuts in police and fire services. "I don't see governments jumping in to do it."